May 11-13, we'll hold our first MOB grazing school at the ranch!!! Ian Mitchell Innes will be teaching. My dad invited me to my first "Ian" school and it completely changed my management. Sure, we've been Holistic managing for several years and it involved intensive, planned grazing and definitely took us to the next level; however, I never dreamed there was another level and what the results could be! From I-35 (coming from the North or South) take exit 15 for Marietta, OK. Go West on Highway 32 approximately 10 miles to the Falconhead Resort gated entrance. You will tell the gate attendant you are there for the Ian Mitchell Innes Grazing School. Follow the road through Falconhead for 0.9 miles and watch for the restaurant sign on your left. Conference room will be inside the restaurant building. The largest selection of hotels and restaurants is in Ardmore, OK or Gainesville, TX. Both are approximately 30-40 minutes from Falconhead Resort. Marietta, OK has a small motel and several fast food restaurants which are approximately 10 minutes from Falconhead Resort. For minimal (accommodations and meal options) Falconhead Resort has rooms available. Managing with nature is soooooo much more fun! These pictures are before or during grazing. The feed below is put on the ground in an attempt to protect and feed the soil. The good part about it is the cattle do it while they graze. See the Mot Faced Cow! Is she feeling good?! What are the benefits we have seen? Remember this is all with no feed, hay or spray! Can you tell where the fence was the previous time? 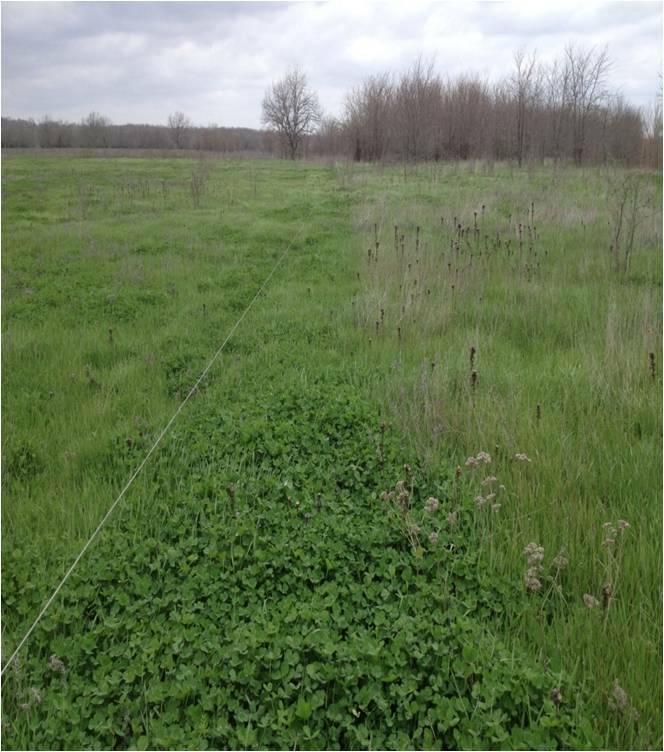 Both of these pictures are in timber areas that were not very productive. Mob grazing made some changes!!!!! How does all of this translate to the bottom line? I think the cattle side is self explanatory, no feed, no hay. What about the wildlife? Wildlife are part of our income. Simply put, the bigger the deer the more money. Remember these deer are not manipulated in any way. They are born and raised on 5000 acres with NO inputs other than the natural habitat on the ranch. So, we improve the habitat, we improve the deer!!! !